Offering you a complete choice of products which include vermi bed. 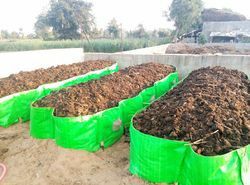 Size 8" * 4" * 2", 12" * 4" * 2", 16" * 4" * 2"
Product DescriptionThe offered Vermi Bed is used for processing of waste by worms. The provided bed is manufactured using modern techniques and best quality basic material. Furthermore, before offering to the clients, our skilled quality experts inspect this bed on various quality parameters. Our clients can avail this bed from us at the affordable price.